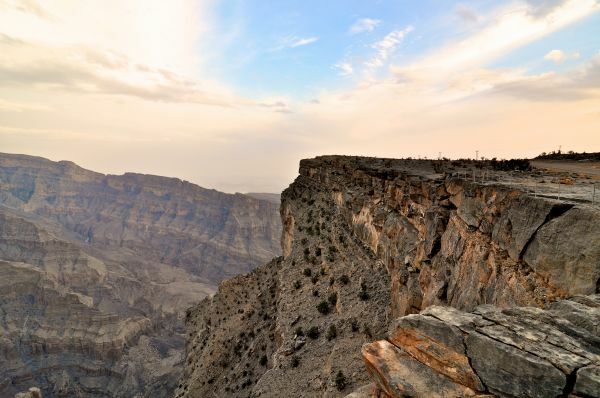 Wadi Nakhur is the huge Canyon of this Mountain which also known as "Grand Canyon of Oman". The present view includes the gigantic canyon of Wadi Nakhur, the summit of Jabal Shams just above where the canyon starts, and the town of Al Hamra (visible far away over the mountains. Jebel Shams is also popular with local Omani families as a great picnic location to escape the relentless Middle Eastern heat. Needless to say, this popularity has prompted local authorities to pave very good roads to the summit and casual road trippers can rejoice. Visiting Jebel Shams is highly recommended as a day trip or a 2-day trip. The cool temperature and sharp cliffs offer a very sharp contrast to the hot and flat landscape typical in other parts of Oman. Jebel Shams or "Sun Mountain" offers specatcular views and has an ideal climate all year round even in summer, rarely exceeding 32 degrees. Jebel Shams is Oman’s highest peak, and at around 10,000 feet (or 3,000 meters) it makes a cool contrast to the baking coast. The regular road runs out about two-thirds the way up, so from there on in it’s 4-wheel-drive or, for the adventurous, hiking. Either way you’ll have stunning views of Wadi Nakhr, a dramatic canyon whose sheer walls drop down to a valley floor of tiny villages and date palm plantations. Colorful rugs made using goat hair and natural dyes are a specialty of the region. There are also a number of eerie village ruins which testify to the difficulty of living in this fascinating yet challenging area.